Luisa Muradyan’s moving, wonderfully funny first volume of poetry merges an immigrant’s passionate study of her adopted culture with Gen-X media obsession. Under Muradyan’s care, memories of Predator become a meditation on faith, and “Yippee-ki-yay is really / another way to say Baruch ata Adonai.” Prince’s Purple Rain links women to the angels. Gratitude and the World Wrestling Federation collide in “Macho Man Randy Savage (“First Thanksgiving, 1991”). These touchstones become keystones in the bridge between her childhood in the Soviet Ukraine and adolescence in the United States. Odessa looms in these poems, a city that haunts those who leave it. Her family’s history is bound up in the history of the city; both recur throughout the book, creating an other-space of geography and memory to which she inevitably returns. But the book is not entirely haunted. 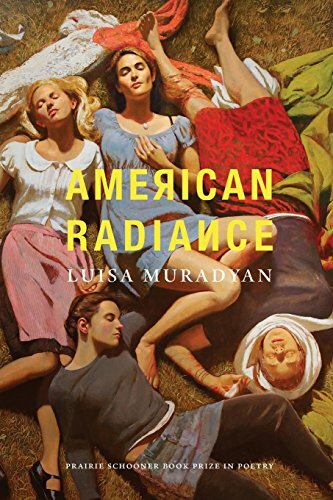 In between flickers of totalitarian devastation, Muradyan delightedly sinks into the comfort of everyday American life. She informs us that “Marriage is a lifelong commitment / to buy groceries for another person.” A catalogue of ornithological study encompasses “5. A blue bird / 6. A bluer bird / 7. A bird that just feels blue.” A peeping Tom delivers elaborate love poems in broken student French. The book’s most delightful poem, “Clams,” declares its independence from prescriptivism: “You say don’t use words like sad in poetry / but I am as sad as a sad cloud crying / at a sad cloud convention. / If sadness were a fruit / it would be a sadberry / which is related to the blueberry / but sadder.” This playful, flexible language and whimsical humor is Muradyan’s strength. The book is littered with genuinely brilliant poems. They could lure disenchanted rationalists back to poetry. They might ignite a new movement in a culture. They are wonderful. Not every poem can be wonderful, and not every poem here is. The book has a whiff of collecting all the publishable poems Muradyan has written so far. They aren’t entirely unified in theme and purpose. While the first part, “Psalm for Odessa,” joyfully links her approaches, the second section, which shares its title with the book, too easily breaks apart. Bright, sharp pieces like “Poem for the Man Playing Piano in Front of the Wall of the Police” are forced to keep company with academic efforts like “Spicer’s Promise to Lorca,” which demands too sharply to be included in a literary tradition and reveals its student origins (she is presently a PhD candidate in poetry at the University of Houston). Muradyan is an enormously talented poet. American Radiance has the raw awkwardness of a first poetry collection, but her writing shimmers with strength and certainty. Her next collection will be better, but wise readers will buy this book and keep it, to love and to show, in the future, that they recognized it at the time as a sign of even greater things to come.